Need your ACT! data on your phone? Don’t want to pay monthly fees to get it there? Here’s how to do it. Using a Google or Gmail account and CompanionLink, you can get subscription-free wireless sync between ACT! and BlackBerry, Android, iPhone, iPad, Windows Mobile, and Palm devices. This is possible courtesy of a free over-the-air sync service called Google Sync (offered by Google). 1. Download a free 14-day evaluation version of CompanionLink Express. 2. Create a free Google/Gmail account, if you don’t already have one. 3. Configure CompanionLink Express to sync ACT! to your Google/Gmail account. 4. If you want to sync with an iPhone, iPad, BlackBerry, or Windows Mobile device, set up the free Google Sync service with your device. If you have an Android or Palm webOS device you don’t need to set up Google Sync because those devices automatically sync with your Google account. That’s all there is to it. We have setup guides and free support if you need it. Happy syncing! This entry was posted in CompanionLink Products and tagged act blackberry, act iphone, ACT! android, ACT! 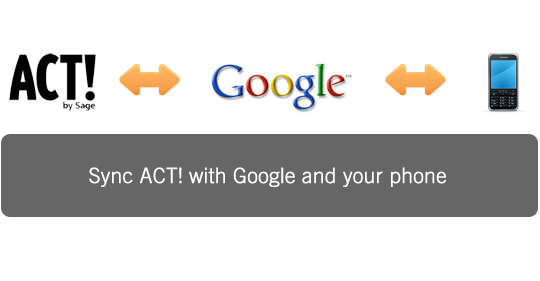 Google sync, ACT! iPad, ACT! to Google by Rushang. Bookmark the permalink.